Banka Bioloo provides eco-friendly and sustainable solutions for sanitation in rural, urban and peri-urban areas. Bio-toilets (or bioloos) treat human waste using bacterial culture, which eliminates the need for excreta disposal and treatment. 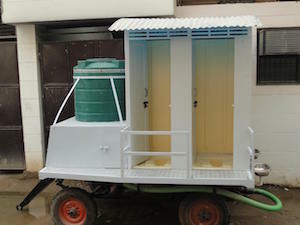 The system disposes of human waste in a 100% eco-friendly manner, saves energy, conserves water, and produces bio-gas. Offerings include: bio-toilets for families; public and community bio-toilets; bio-toilets for schools, institutions and companies; bio-tanks for Indian Railways and other organizations; bio-digesters (the bacterial culture) for bio-toilets and bio-tanks; and upgrade of septic tanks to bio-tanks. Banka also services bio-toilets and similar advanced toilet technology (CDTS) deployed by the Railways, and have entered into annual operations and maintenance contracts (AO&MC) with Railway zones and other corporate bodies.